This weeks review is of a book I was hesitant to read even though I had been hearing good things about it since its release. You see I am not a big fan of Mark Millar's books after a certain point. After Superman: Red Son and Ultimates to be more specific. That said I am a huge fan of the pulp heroes like Flash Gordon, so I decided to give this one a chance. Starlight is the story of Duke McQueen(a great name by the way), an old man who saved another planet forty years ago, and just recently lost his wife to cancer. The problem is that after Duke saved the planet he returned to his life on Earth. So for the past forty years Duke has been dealing with everyone he knows and cares about except his wife calling him crazy and doubting everything he claims to have done. So with his wife gone all he has are his two sons who think he is crazy and/or are too busy with their lives to spend time with him. After being left alone with a dinner that he was preparing for his kids and grandkids Duke is reflecting on his life since returning when a cloaked spaceship arrives at his house. A ship piloted by a teenage boy from the planet who claims that Duke must return because there is a new and far worse threat now ruling over the galaxy called the Broteans. What follows is a fun pulp sci-fi adventure with some of the best Millar work I have read for quite sometime. Lets start with the Main character of Duke McQueen, whose name invokes to legendary actors that I am big fans of. John Wayne who had the nickname “The Duke” and Steve McQueen. and coincidentally I feel the character design for Duke McQueen makes him resemble both legends. McQueen when he is younger, and Wayne in his present day appearance. But looks aside, the character of Duke McQueen is a fun and relatable character. Duke faces very real problems before he makes the journey back to space. Duke wants nothing more than to have his family together around one table on the anniversary of his wife’s death, but because his sons are embarrassed of their father and his tales or space travel and toppling dictators, they can’t be bothered to make it to his house for dinner. As for the rest of the cast of characters. There is a decent group of supporting characters that all bring their own unique personalities and quirks. For example Krish or Space Boy as Duke refers to him is a peppy teenager who has a dark past with a high ranking official in the Brotean hierarchy. The main villain comes off a little over the top at points, but it serves to make Starlight feel more like Ming in the 80’s Flash Gordon movie. The Goran Parlov art isn’t the best I have seen from him, but it is amazing just the same. Parlov brings both the world to life beautifully. Whether he is drawing the boring midwest town Duke lives in, or the sweeping landscapes of the foreign planets he visits in the past and present. Parlov manages to make everything look lived in and beautiful. 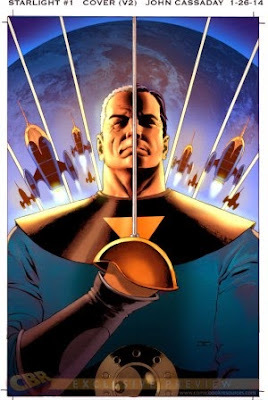 I really hope that Millar and Parlov do a second volume of Starlight. I’m not really sure how they will do it, but there is a lot of possibility for more stories in this universe.